For some, choosing a new iPhone case can be as simple how it minimalistic it looks without detracting from the iPhones overall shape and how it feels in the hand, while for others it’s about protecting their investment, choosing the biggest and most protective case available and not worrying about how it looks or feels.Whether you are the person who likes to go with the simplicity of a minimalistic clear case or you’re the opposite and you want to cocoon your brand new iPhone XS in the most exotic and durable materials available, we reviewed a number of iPhone cases and have put together a list of the ones that we like the most. For the first list below we have chosen 10 clear cases, ranging from ultra-thin to ultra-protective. This ultra-thin crystal clear case offers drop protection from up to 10 feet (3 metres) using Tech21’s Bulletshield™ technology, scientifically proven impact material in a slim design which doesn’t add unnecessary bulk while protecting your iPhone from impacts. 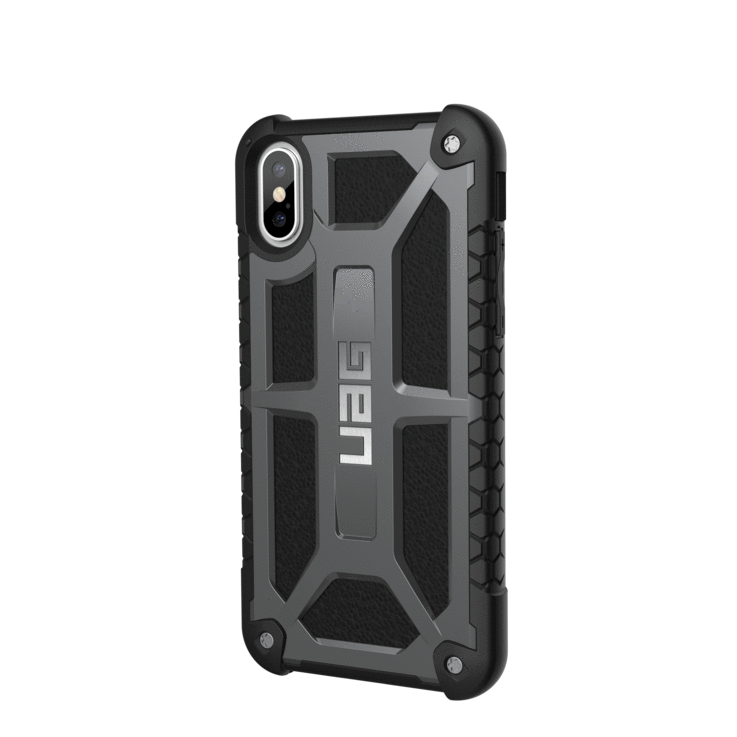 The overall feel of the case is hard and smooth with less flexibility than a traditional TPU case which does help keep the phone locked in and make it less likely to accidentally come out of the case during a drop. Tech21 have added materials in the production of the case which helps it resist yellowing from UV exposure over time, however, due to the nature of the harder clear material which it is made from makes it prone to light scratches on the clear back. 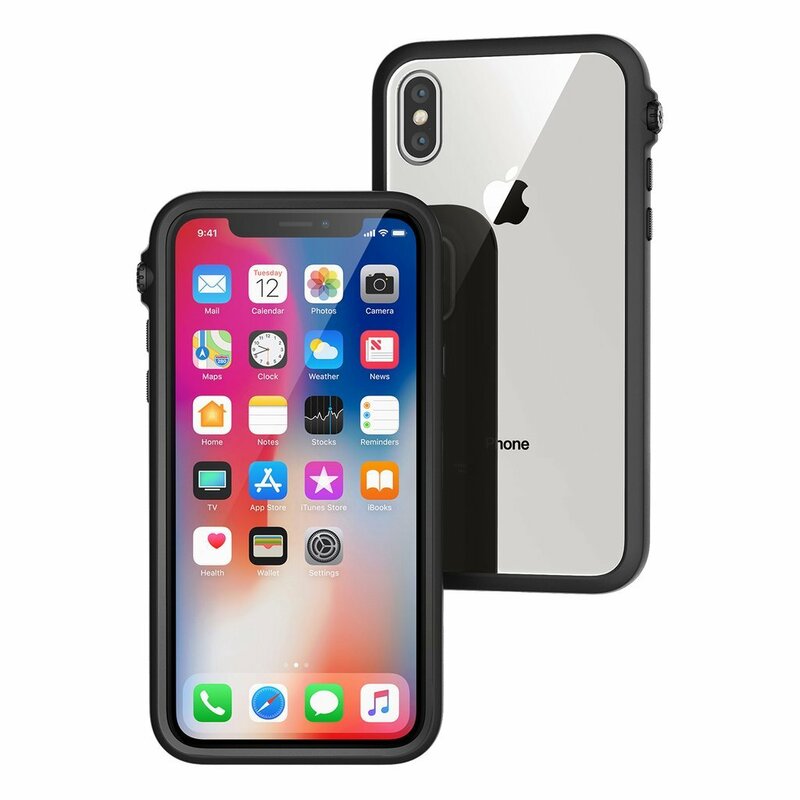 The Incase Pop Case II is made of 3 layer TENSAERLITE™ protection technology that absorbs impact energy from drops, it’s a flexible, light, impact absorption material which combined with the air pocket construction for the bumper offers superior protection. 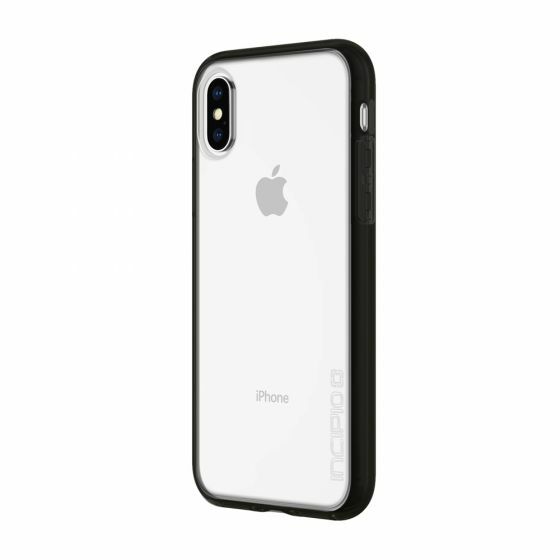 The Pop Case II comes in two options of either white bumper or black bumper with a glossy hard clear back to show off your phone, it’s going to be a personal choice to match best with the colour of your iPhone, however, keep in mind the white will show more discolouration over time than the black from basic everyday handling. 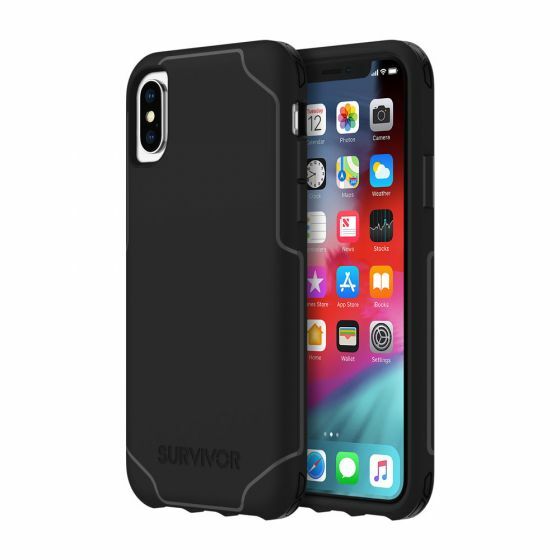 Overall the design of the case offers great protection from drops and impacts due to the bumper design however the downside to this case is it does feel rather bulky because of it. Crystal-clear rigid slim case made from dual premium materials, the back is a glossy transparent Plextonium™ polycarbonate and the outer edge bumper is made from impact resistant Flex2O™ TPU, designed to withstand drops from 6ft this case has a nice slim design with good grip. 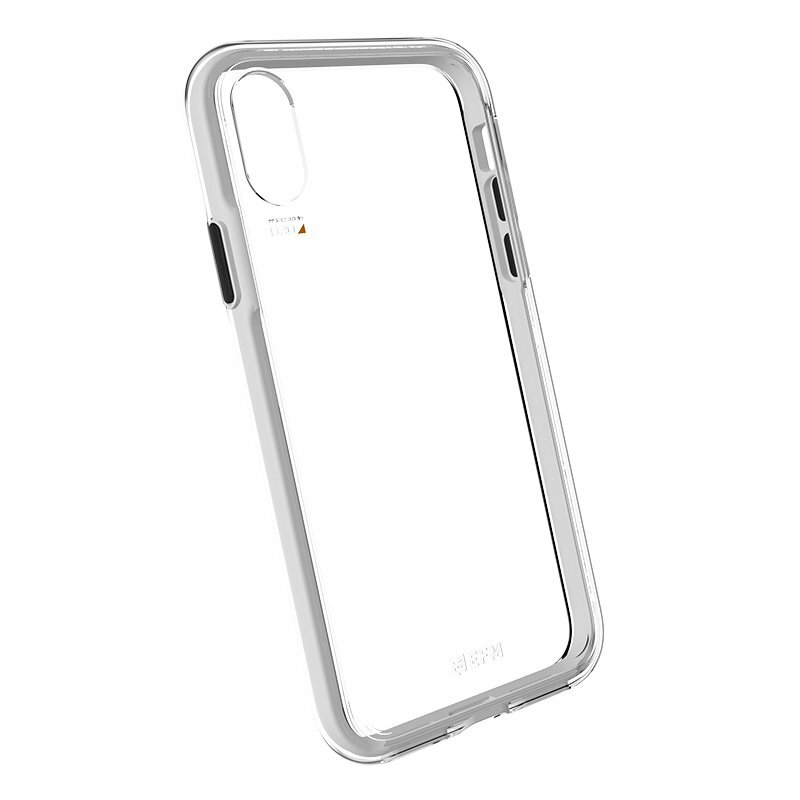 The Incipio Octane Pure Case comes in a clear finish or you can choose the bumpers to be either translucent rose colour or black to match best to your phone. A very thin lightweight polycarbonate clear case which is scratch resistant and offers drop protection of up to 3 feet. 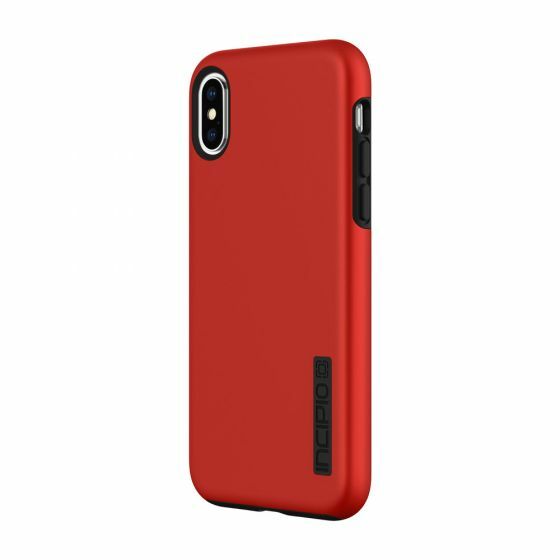 This case has subtle rubber accents which protect the phone in areas which are needed most while not adding unnecessary bulk and help provide additional grip. The Griffin Reveal case is definitely value for money when compared to the other cases we reviewed and it also works well with the iPhones wireless charging. Although like most clear cases with a glossy finish, fingerprints seem to be our biggest gripe. If you want additional protection Griffin do have a good range of other cases offering increased protection on their website. 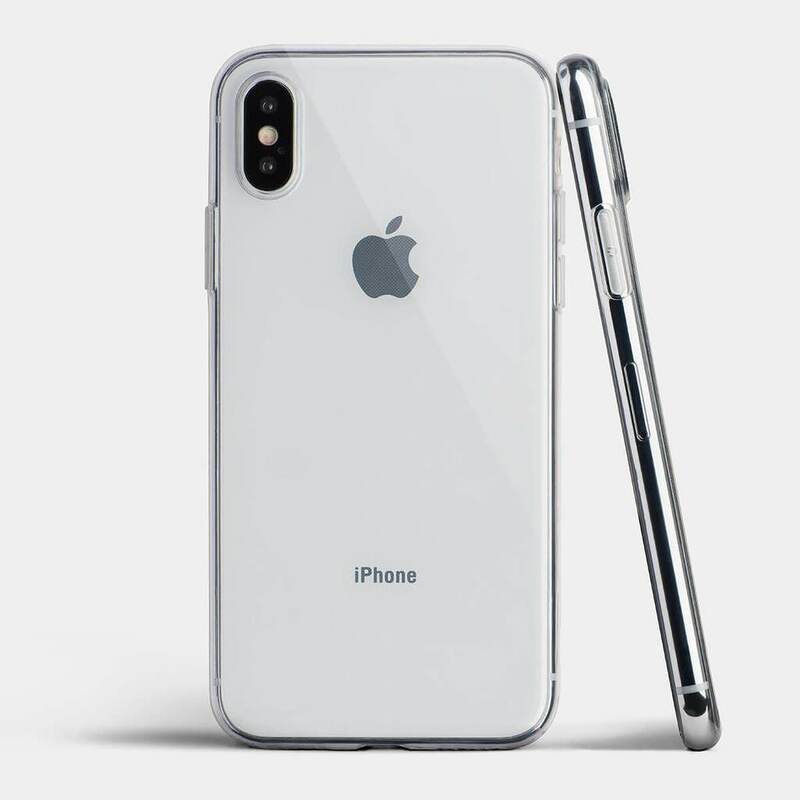 Now, when looking for a clear iPhone case that offers superior protection while still having a slim look and feel, the EFM Aspen Clear Case is a hard one to pass by. It was the more expensive that the other clear iPhone cases however at $49.95 its a small price today for the level of protection it gives. Definitely worth the extra money when looking for a high protection iPhone case. 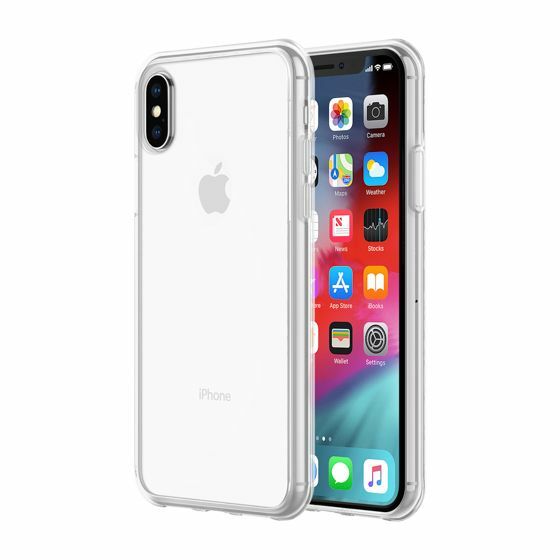 The EFM Aspen Clear Case is integrated with D30® patented soft flexible materials which have high shock and impact absorbing qualities around the bumper area of the phone case which gives the case its high level of impact resistance. The Totallee thin case is all about being minimalistic, from the simple but well presented packaging right down to the case itself. It may not offer you the protection from a huge drop but the case fits like a glove and you almost can’t even tell you have it on the iPhone. This case has cut outs for all side buttons rather than built-in raised button covers like other cases we compared but that only maintains the iPhones original look. Available in a crystal-clear gloss finish, a matte finish clear and other colours with zero branding, the Totallee thin case has a good amount of grip in both finishes we tested and feels great in hand. One of the downsides is definitely the lack of protection a minimalistic case gives, there is no raised bezel surround so if you place your iPhone face down your display will be in direct contact with the surface you place it on. 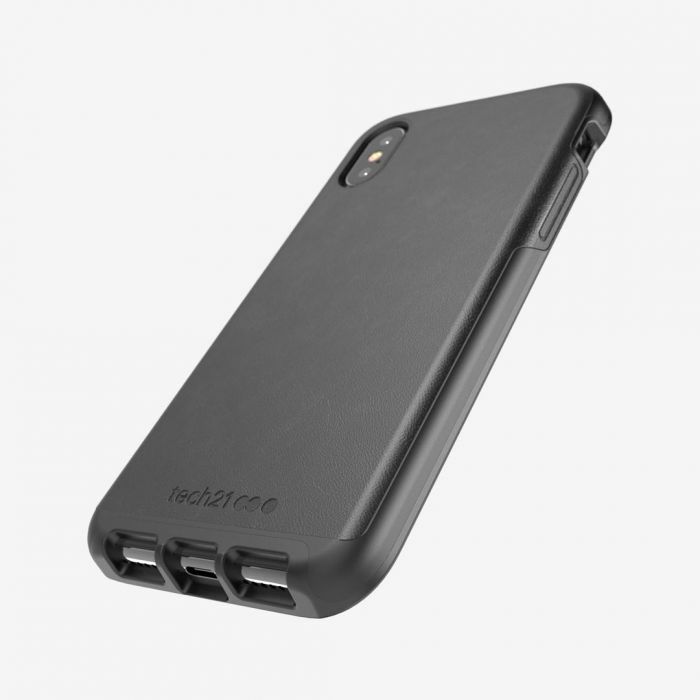 If protection from 10ft, 6ft or 3ft is not what you are looking for in a case and its more about keeping your iPhone free from scratches while keeping the look as originally designed the Totallee Thin Case is definitely one case you should not look past. The Peel Super Thin Case is all about maintaining the look of your new iPhone. As is the same with all minimalistic cases, its not about providing protection from a high drop test, its for the person who wants to keep their iPhone look and feel as original as it came out of the box while offering enough protection from everyday use minimising scratches and scuffs keeping the phone looking newer for longer. 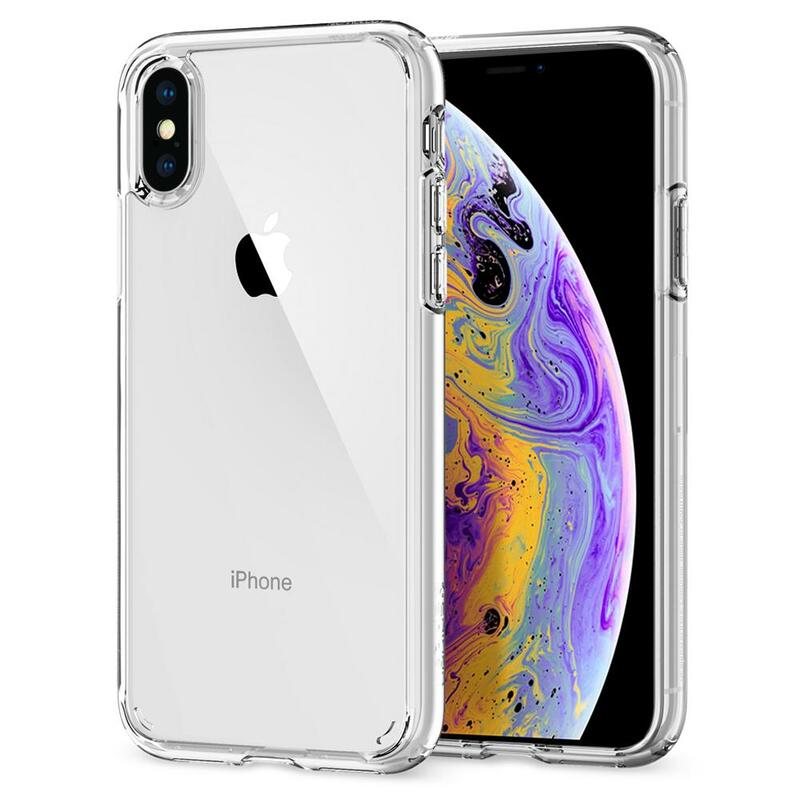 Available in crystal-clear, matte finish clear and plenty of other colours to choose from this case offers a good amount of grip and almost feels like you don’t have a case on at all. Elago Slim Fit Case is a hard shell type case which has been improved with more material to cover the buttons and now has only two small cutouts for stress relief in the lower edge to help with clipping it on over the phones edges due to the minimal amount of flex in the polycarbonate material. The case comes in a crystal-clear and a frosted clear look as well as other colours however the case doesn’t have the most grip to it out of all the cases we tried. It does provide a scratch resistant surface to stay looking great for longer and is fully compatible to work with Apple Pay and wireless charging without having to take the case on and off. 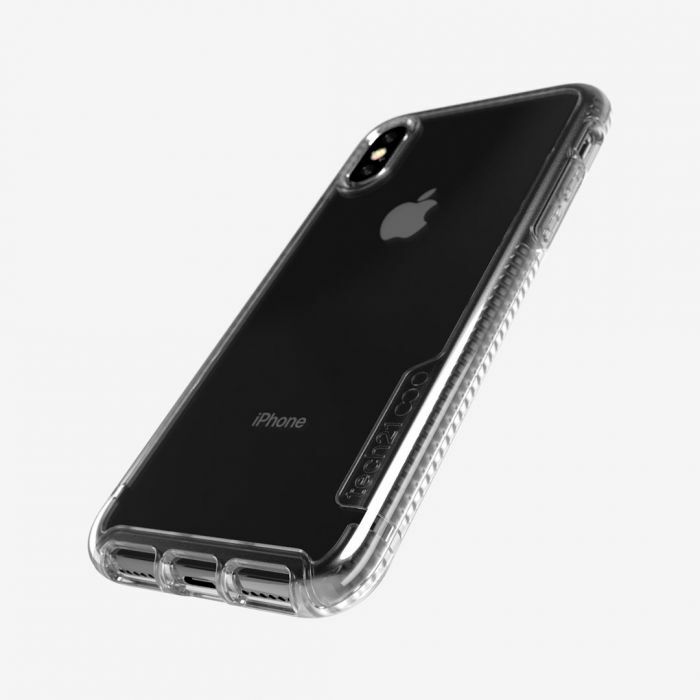 The Ringke Air Case is a thin clear flexible TPU (Thermoplastic Polyurethane) and very affordable case, its the cheapest case we reviewed offering great value and good protection. One of the main downsides to a clear TPU case is how quickly it can turn yellow from UV exposure taking away the desired clean look we all want. Made completely in one piece this case is designed really well and has a snug fit which is easy to take on and off due to the flexible nature of the material. It has a raised bezel surround which helps stop the iPhone screen touching directly on the surface you place it face down on giving additional protection and minimising scratches to the glass if you don’t have a screen protector. 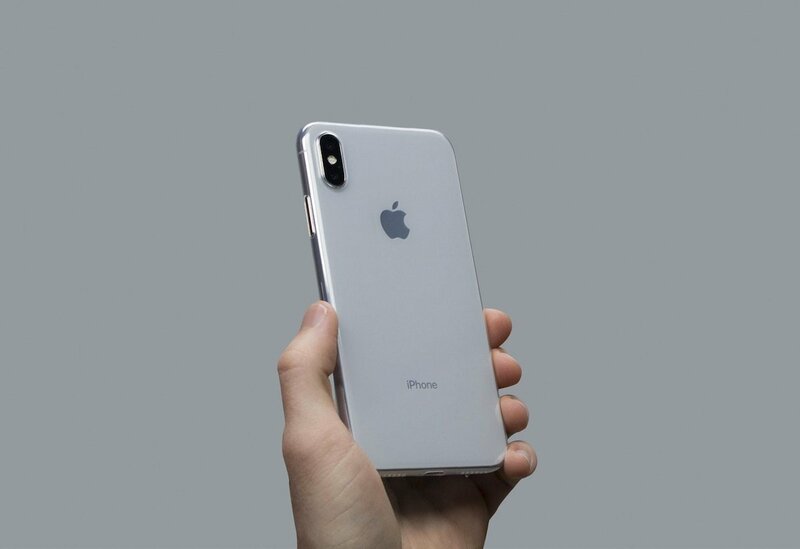 Not everyone will be looking for an iPhone case to be crystal clear, some of you may be looking to coordinate your new iPhone XS with other accessories you own, or your favourite colour may not be space grey, silver or gold. 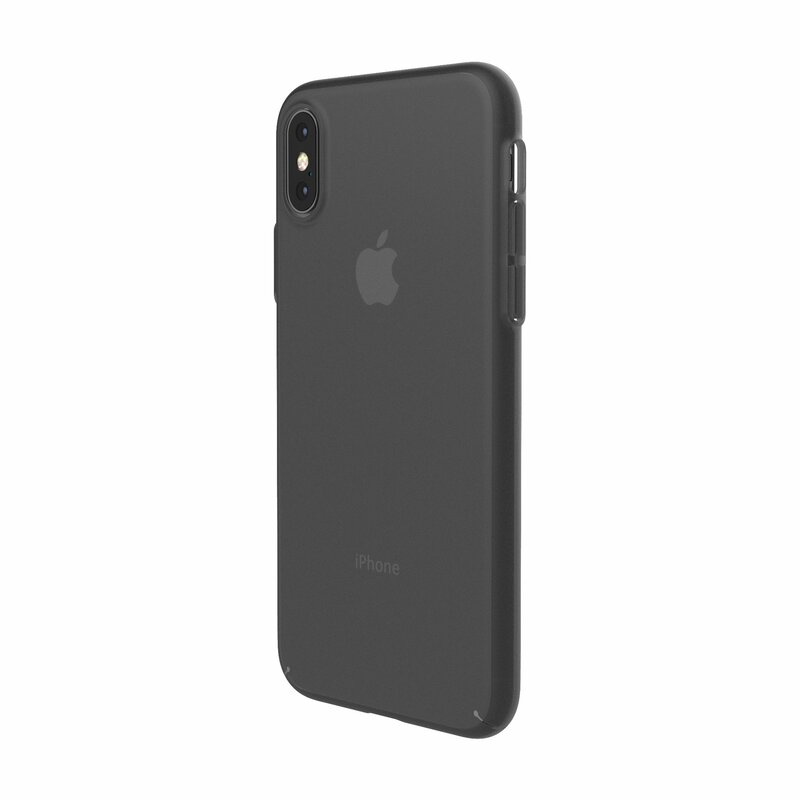 For the second half of our iPhone XS case review we have chosen a list for the person who likes to accessorise and individualise their iPhone, these iPhone XS cases are the ones we liked that come in an assorted range of colours, designs and finishes from simple and minimalistic to cases made from luxury materials. We sampled just two of Tech21’s iPhone cases and were very impressed with the overall finish. Another great slim case from Griffin, this time with a two piece construction in either clear or black, you have the polycarbonate impact resistant inner layer which fits snug with the iPhone and a non-slip grip outer TPU material for the shell which work together giving this iPhone case drop protection for up to 7 feet (2.1 Metres). The Incipio DualPro Case is another two piece design available for the iPhone, available in six colours to choose from, the look and feel of this case is silky smooth, it has a soft touch finish to the outer polycarbonate rigid layer which provides a nice amount of grip and gives the case its seamless matte finish look which is also great at resisting any finger prints and light scratches. The inner layer is a shock absorbing, rubbery material which is integrated nicely with the outer layer design showing off its dual layers, with the show through logo on the back, around the side buttons and hole cutouts at the bottom. The Incase Lift Case is a very slim, minimalistic and durable case design, made to keep bulk down to a minimum we like the fact it still does have a raised bezel surround to protect your iPhone display when playing it face down on a surface. Made from fairly rigid material it has only two small cutouts for stress relief in the lower edge to help with clipping it on over the phones edges when installing. 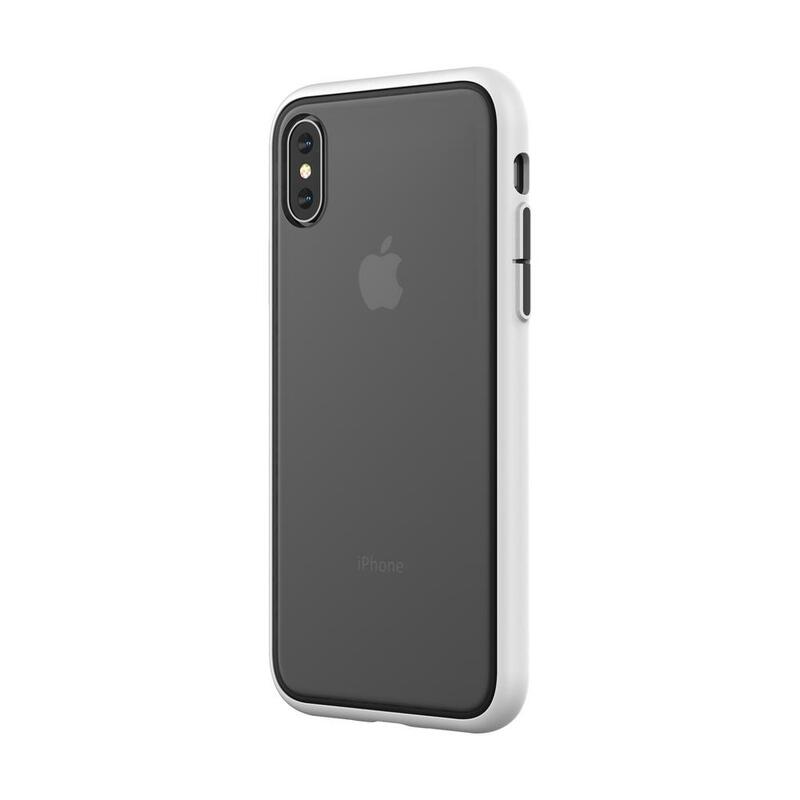 The case comes in a clear translucent and a graphite translucent finish with a fairly good amount of grip and provides a scratch resistant surface to stay looking great for longer and works with wireless charging without having to take the case on and off. 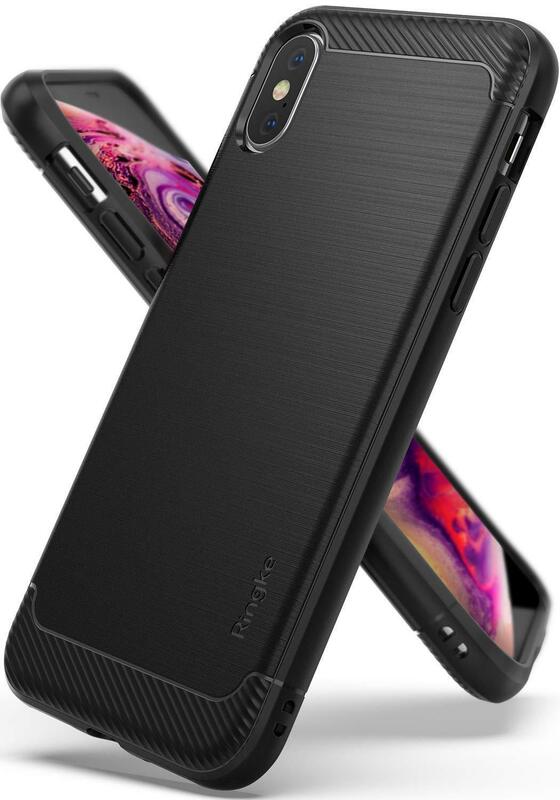 Ringke have created a premium looking iPhone case with their Onyx case range, putting it simply its just a TPU case, except they have definitely thought about the design and appearance with the textured finish to resemble a premium brushed metal. Available in black and lilac purple, the Ringke Onyx case has a soft, flexible feel with a slightly increased thickness of material around the bumper areas to help absorb and protect your iPhone from small knocks, bumps and drops. 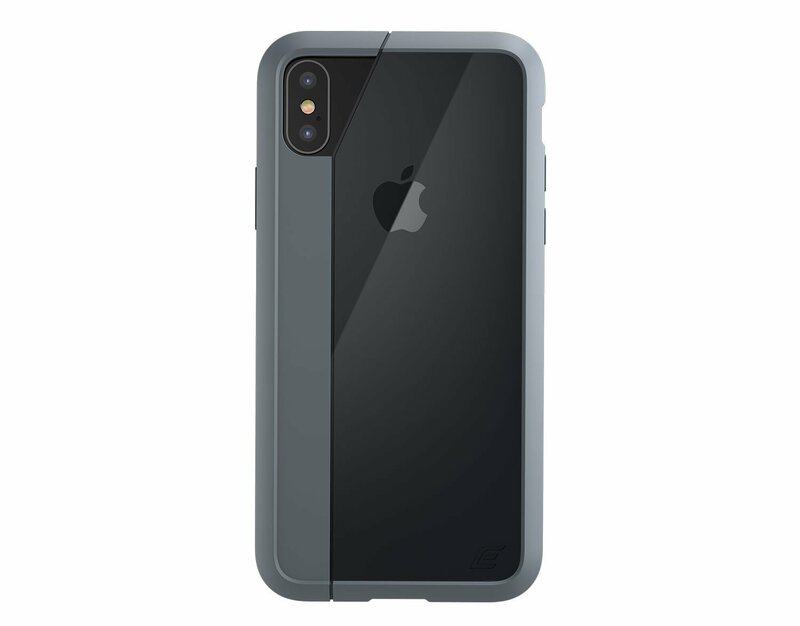 The sleek grippy rubber design of the Catalyst Impact Protection Case that wraps around the iPhone gives 9.9ft of drop protection, designed with what they call impact truss system, its pattern creates tiny air gaps between the phones edge and the case helping absorb any impacts. The colour options are great and all come with a hard clear back to showcase your iPhone. One interesting design with this case is the rotating mute switch, it fits the design of the case well and doesn’t look out of place. 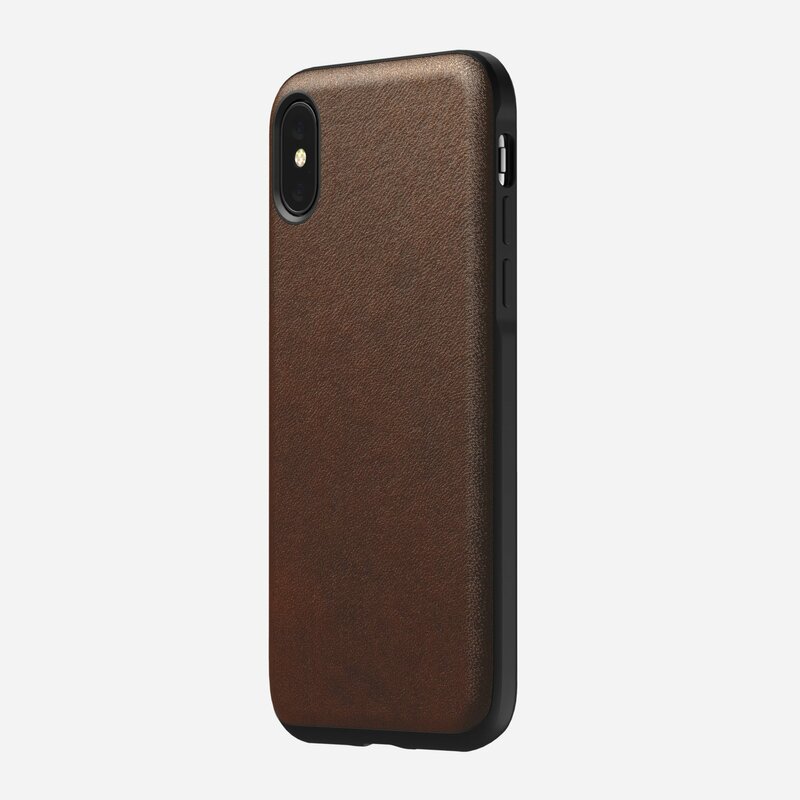 Nomad are known for creating premium durable products for tech and thats exactly what they have done here for the iPhone XS, the Nomad Rugged case is minimalistic in design with a simple TPU formed iPhone case with a Horween leather outer, the beauty about having a premium leather outer is over time it will weather and patina like an expensive leather wallet adding character to your iPhone. The most important part of this case is its still designed to offer your iPhone 10ft drop protection. 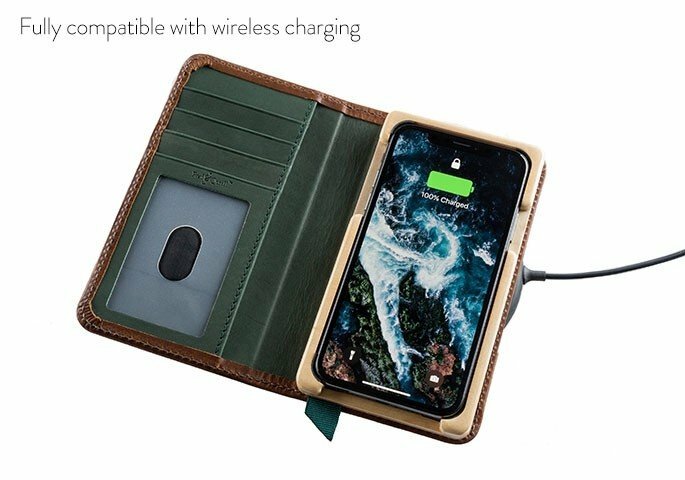 This iPhone case is the by far the dearest one we selected, granted, it is designed to double as a luxury leather wallet and an iPhone case in one. The premium finish is made from full-grain American saddle leather for the exterior and a precision milled Baltic birch wooden cradle to protect the iPhone from impacts. This case is exceptional in its quality materials and workmanship, its even backed with a lifetime wood warranty and a 25 year leather warranty. 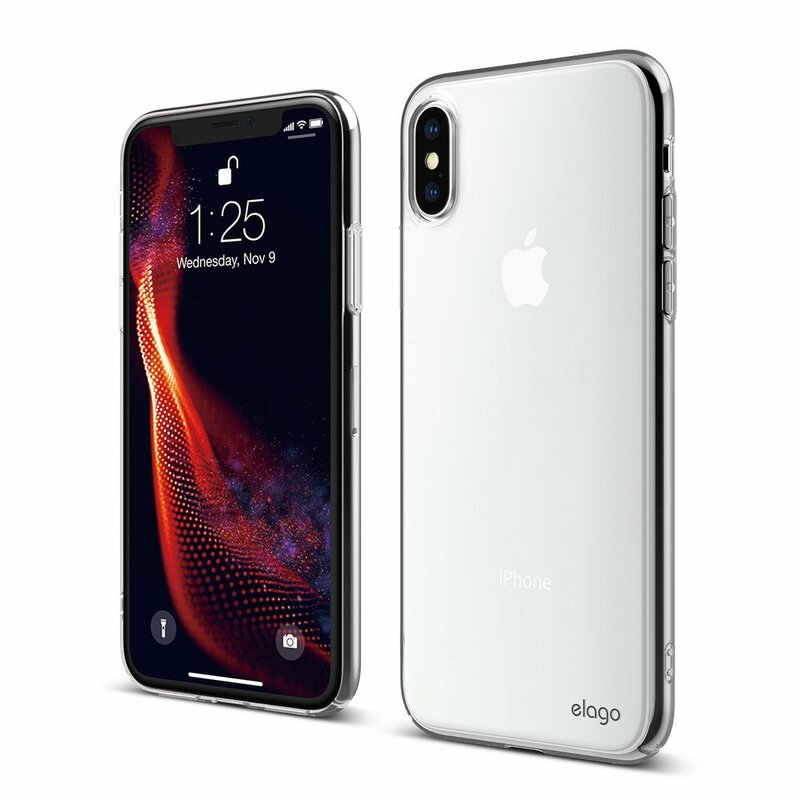 One of the questions we came across a lot while doing our research was will the case work with wireless charging and apple pay?, all of the cases we reviewed were manufactured using materials which do not block the iPhones ability to use a wireless QI charger or Apple Pay. 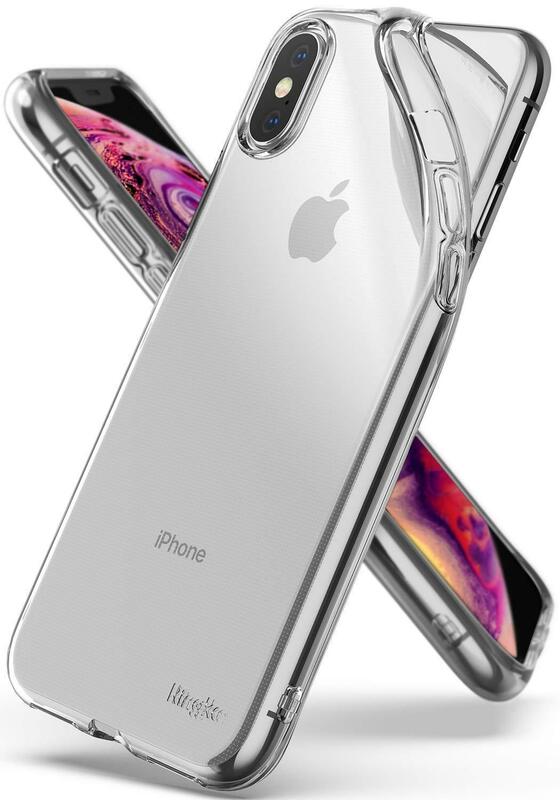 No matter what criteria you decide to use for choosing the right case for you just remember that minimalistic offers the least protection from shocks and drops, while it may look nice and sleek the cost of replacing the iPhone XS screen not cheap, maybe compromise and take on a little bit of bulk, you will thank yourself the next time you get that gut wrenching feeling while reaching down to pick up your prized possession after it slipped from out of your grasp. Feel free to share your thoughts with us on the iPhone XS cases we listed above or one that you like and let us know what made you decide on the case you have.